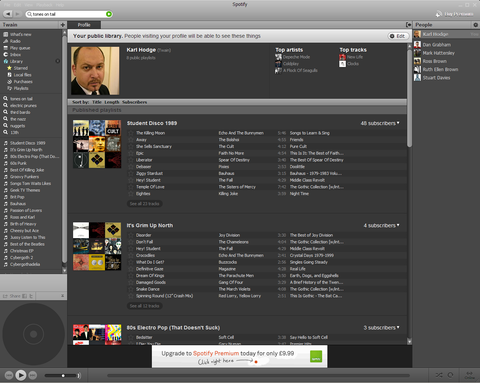 Spotify has gone to version 0.4.3. Ooh, exciting. Well, actually, ye of little faith, it is pretty good. The streaming music player for desktop and mobile has rolled out two big new features for PC and Mac that make it worth the upgrade. First up, you can now hook Spotify into Facebook, adding Facebook friends who’ve done the same. This enables you to publish playlists and tunes to Facebook and send individual songs directly to friends. You also now have a profile page within the application that’s visible to said friends. All your public playlists are visible and friends can choose to subscribe to them. As a fan of both Spotify Mobile and Spotify, I’m excited to have these new features, but a bit disappointed that there’s still no facility to publish playlists to a central search service. Support for Facebook and Twitter publishing is built in, but there’s no love for sharemyplaylists.com – a searchable playlist database. Hi Matthew. Good catch on that mobile functionality - I'd missed that. However, while I'm aware that the upgrade is being rolled out in stages to existing users, I was (apparently) able to force the upgrade by downloading the client again from www.spotify.com/uk/download - as have several of my colleagues.